Nik Szymanek, is a prolific Astrophotographer, sky photographer, musician (rock drummer) and astronomy writer, based in Essex, England. He is especially known for his stunning deep sky CCD images and his contributions to education and public outreach. He collaborates with professional astronomers and works with big telescopes located at La Palma in the Canary Islands, and at the Hawaii Islands.His imaging and image-processing abilities brought him the Amateur Achievement Award of the Astronomical Society of the Pacific in 2004. He publishes his pictures in astronomical magazines and has written a books on astrophotography called “Infinity Rising” and “Shooting Stars”. The ‘Astrophotography curious’ amongst you really shouldn’t miss this one! Bob Lambourne is head of The Open University Physics and Astronomy Department. His research interests include astronomy and physics education, and he teaches across many fields including astronomy, particle physics, relativity and cosmology. Bob’s lectures are always popular and we are delighted that he is able to speak for us this time about the lifespan of stars. Wednesday 18th November at Woodrow High House Sports Hall. This Lecture details the discovery of Pluto and Charon. Dr Mike Leggett discusses Pluto: planet or dwarf planet? He will cover -Neptunian Objects. Edgeworth-Kuiper Belt. Kuiper Belt Objects. Plutinos. Cubewanos plus the New Horizons mission to Pluto, Charon and the Kuiper Belt. Oort Cloud. Comets. The boundary of the Solar System. Pioneer &Voyager's Interstellar Mission. A Fellow of the Royal Astronomical Society and a Fellow of the British Interplanetary Society, Dr Mike Leggett is also a member of the British Astronomical Association, the Planetary Society and the Society for the History of Astronomy (SHA). As a participant in the SHA Survey of the Astronomical History of the UK, he is currently the coordinator for Buckinghamshire, Lincolnshire and Rutland. As a founder member of the South Lincolnshire Astronomical and Geophysical Society in 1976, he began to present astronomy talks for his local society. Since that time he has presented lectures for the British Interplanetary Society, at University of Aberdeen evening classes, for the Society for the History of Astronomy and to astronomical societies and other groups throughout the UK. He is currently Publicity Officer for the Milton Keynes Astronomical Society, for whom he has also served as Chairman and Secretary. He is also a Council Member and Publicity Officer for the Society for the History of Astronomy (SHA) and county co-ordinator for Buckinghamshire, Lincolnshire, Norfolk and Rutland in the SHA survey of astronomical history of the UK. A Graduate in Chemistry and Pharmacology from the University of Nottingham, Dr Leggett also holds a PhD in Chemistry. A Chartered Chemist and a Member of the Royal Society of Chemistry, he is a member of the Astrophysical Chemistry Group. He also holds a Postgraduate Diploma in Technical Authorship and Communication and is Member of the Institute of Scientific and Technical Communicators. 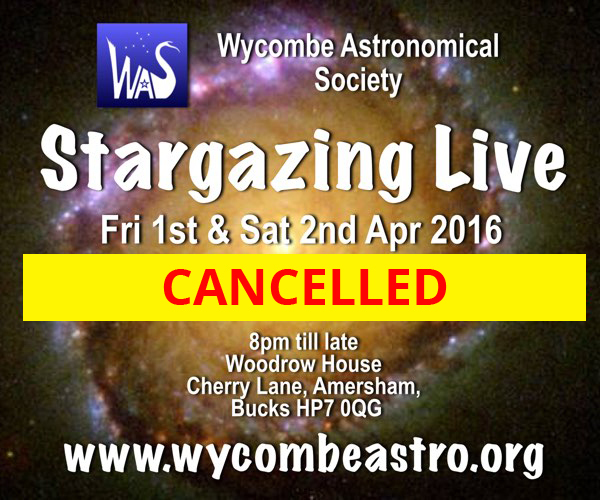 Sorry - please note, this event has been cancelled due to unforeseen circumstances and will be re-scheduled a.s.a.p. Nigel John Mason was born into physics, his father being Sir John Mason FRS, Director General of the Meteorological Office and a noted environmental physicist. Thus he was "indoctrinated" at an early stage into recognizing physics as the premier science. After graduating from University College London in 1983 his postgraduate studies involved the study of electron collisions with atoms and molecules in the presence of laser fields. As part of the atomic physics group at UCL he was able to demonstrate, for the first time, a prediction first made in the 1930s that in a three-body collision between an electron, atom and photon the electron may excite the atom by "absorbing" the photon, even if its initial kinetic energy is less than the excitation energy of the atomic state. Awarded a SERC Postdoctoral Fellowship in 1988 and a Royal Society University Research Fellowship in 1990 he established the Molecular Physics Group in the Department of Physics and Astronomy, University College London in 1990. The group rapidly developed a wide ranging research programme studying atmospheric physics (in particular the mechanisms of ozone depletion and global warming), collision physics and plasma physics. He was a co-founder of the UCL Centre of Cosmic Chemistry and Physics commencing a research programme to study molecular formation in the interstellar medium and planetary atmospheres. Appointed Lecturer in 1998 and Reader in 2000 he joined the Open University in September 2002 as Professor of Physics. Co-founder of the Interdisciplinary Centre for Astrobiology and The Centre of Atomic and Molecular Engineering his research interests have expanded to include research in nanotechnology, radiation chemistry and the origins of life. He has served on many National and International Committees and co-ordinates several major European projects. He is a keen promoter of physics and public understanding of science having held senior positions in both the Institute of Physics and the British Association of Science. In his spare time (!) he writes on military history, in particular the Napoleonic Wars. Married to Jane they share their house in Heath and Reach with two Turkish Van Cats, Pushkin and Vashka. Wednesday 16th September at Woodrow. An elected fellow of the Royal Astronomical Society, co-presenter and writer of the popular Awesome Astronomy podcast, committee member of the world famous Baker Street Irregular Astronomers and has appeared on BBC News and Radio to discuss a range of astronomy and space issues as well as being interviewed on The BBC’s flagship astronomy program, The Sky At Night. He is also part of the team that runs the bi-annual, family friendly AstroCamp in the Brecon Beacons. Pauls mission is to take astronomy education into schools and the wider community, enthusing children and adults alike about the universe around us. Paul will take us on a journey through cosmology, the life and death of stars, life on Earth and what it tells us about what is potentially the ultimate question. It will cover a little of the original topic that Prof Rawlings was going to cover, but very briefly and will go in a different direction and be thought provoking so as to leave the door open for the original lecture at a later date. And no, the answer is not 42. Jonathan was an undergraduate at Corpus Christi College, Cambridge where he gained a BA in Natural Sciences (Physics) in 1982. He obtained an MSc in Astronomy from the University of Sussex in 1983 and a PhD in Molecular Astrophysics from UMIST in 1986. He spent a further three years at UMIST as a SERC Postdoctoral Research Assistant (1986-89) and was a Research Assistant at the Max Planck Institute, Munich, in 1990. He then held a SERC Research Fellowship at Oxford (1990-2) before returning to UMIST as a Research Associate/Temporary Lecturer (1992-4). He took up a Lectureship at UCL in 1994, was promoted to Reader in 2001 and Professor in 2006. He has served on several PPARC/IAU/RSC committees etc. His research interests cover a wide range of theoretical and observational topics in molecular astrophysics, but are largely centred on the study of stellar outflows and protostellar inflows. Major areas of activity include: molecule and dust formation (and evolution) in the ejecta of novae and other strongly irradiated circumstellar environments, the chemistry of excited state atomic/molecular species, and low mass star-forming regions, with a special interest in the earliest stages of protostellar infall. 8:00 pm - 10:00 pm - Sports Hall- Woodrow High House. John Smith with 30ft (9m) diameter parabolic aerial. However in 1994, the current Radio Astronomy Group was created with Gordon Brown as its coordinator, later to be followed by Peter King, Laurence Newell and, most recently, Paul Hyde. Paul will provide a basic introduction to Amateur Radio Astronomy and show what can be achieved with some basic radio equipment, simple antennas, and a computer. We are delighted to be hosting a Stargazing Live Event on the evenings of 27th and 28th of March 2015 Following the popular BBC Stargazing Live TV series broadcast from the 18th - 20th March, Astronomy societies across the country team up to provide the general public with the opportunity to look at the night sky through high powered astronomy telescopes. This year together with Tring Astronomy Centre we will be hosting a Stargazing Live event on the evenings of 27th and 28th March 2015 at Woodrow High House near Amersham Bucks. The event will run from 8pm until 10pm on both days, and is open to all members of the public. Children are very welcome at this event, but obviously the younger ones will need to be supervised by an adult. Subject to the cloud conditions on the night, visitors will be able to look at a variety of objects including Jupiter and its arrangement of moons through the large Celestron Telescope situated within the Wycombe Astronomical Society Observatory. In addition we will have a variety of other telescopes and binoculars trained on a host of interesting objects, each hosted by a society member eager to share the wonders of the night sky with you. If thats not enough! light refreshments including tea, coffee and cake will also be available on the evening. 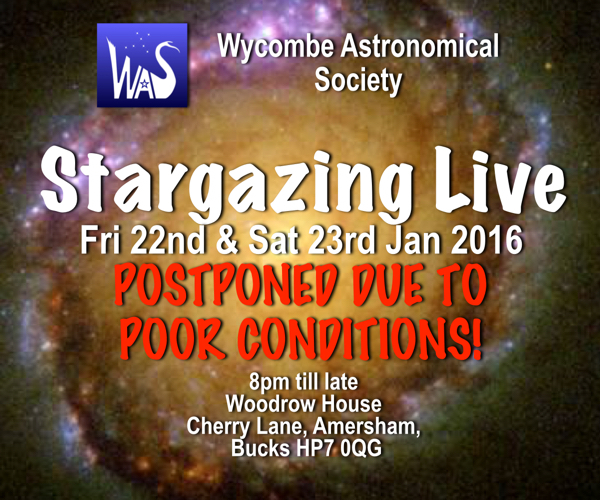 events@wycombeastro.org or you can contact Neil or Jane at Tring Astronomy Centre on 01442 822997 who will be happy to answer questions about the event. latest findings about its inner core, allowing us to embark on an adventure that brings us closer to the enigma of our existence. A unique illustrated voyage, beginning with ‘something of nothing’ and journeying to all that is everything – using perspective to capture the awesome, inspiring and, above all, enjoyable wonders of the cosmos. Jane A Green is a professional speaker, author and broadcaster who has co-presented with the late Sir Patrick Moore CBE FRS, celebrities and media professionals, and has been featured in various astronomy publications and scripted a live television/theatre interview with the second man on the moon, US astronaut Edwin ‘Buzz’ Aldrin. She has been a guest on BBC Radio Four’s Midweek programme, BBC Two’s Stargazing Live, various national and local BBC Radio stations and, most recently, co-presenter of the TOUR OF THE UNIVERSE 2014 – a national theatre tour appearing with the presenters of television’s Sky at Night programme and other high-profile speakers – she is currently Uckfield 105FM’s resident astronomer and a co-host of Astronomy FM Under British Skies. Her book, the Haynes Astronomy Manual, is an international best-seller and was listed at No 6 on Amazon’s ‘List of Collectible Astronomers Books for 2011’. As Dr Brian May states, Jane has “… taken up the challenge of doing for a new generation what Sir Patrick did for us all those years ago”. Her enthusiasm, as with the science of astronomy, is infectious. 8:00 PM - Sports Hall - Woodrow High House. For over 400 years humanity has gazed to the heavens with ever more powerful telescopes, capturing the skies in greater levels of detail. Nick Howe's will talk about "A Brief History of Telescopes" & "The Greatest Scope on Earth", due to revolutionise the very future of astronomy. As a science writer, he has over 400 NASA ADS citations for observational work on comets and asteroids. Entered in the Guinness Book of records for leading a team of UK Astronomers in creating the World's largest image composite of the Moon taken by ground based observations, he is an astronomer working with the Kielder Observatory as well as a freelance science writer whose work has included science writer for the European Space Agencies Science Portal and NASA Blueshift. Chris is a Keen astro photographer based in the UK. Most, if not all his imaging, is done remotely in Nerpio - Spain. Lecture starts at 8:00pm in the Sports Hall. I am a keen amateur astronomer based in Hertfordshire and for a number of years have been imaging deep sky objects. I started observing in 2000 when I first bought a SC and eventually acquired a roll-off roof observatory as I got into Imaging. Even though at that time it was black and white, I have always concentrated on deep sky objects. A few years ago I became increasingly frustrated with the poor weather and the fact the trees around my garden gave me a limited sky. If I was to really produce deep images then I would need a lot of data which was impossible from home. It was then I made the move, in mid 2012 to remote, then robotic imaging, transforming what I was able to achieve. In the past two years I have produced images that I could never have done from the UK; with a number featured in astronomy magazines. It has radically improved the hobby and opened up new possibilities, as an example I will shortly start some scientific projects in addition to the imaging. I have two grown up boys and an understanding wife! Those attending will learn what remote and robotic imaging is all about. The pain and the gain! What options are there? What are the benefits and disadvantages? I will focus on remote imaging using one’s own equipment. What has been the experience? What needs to be considered if you want to do the same? Equipment, software, sites, support? I will cover my experiences from setting-up to where I am today. I will show many images from the first attempt to images that have won prizes. If the weather and comms allows, then we will link to the remote site live and set an imaging run during the talk. I will also spend a short time processing live a set of FITS acquired remotely, using the Hubble palette method, to show what can be achieved. Finally we can have a quick competition- with the prize being the opportunity to use the equipment, with my help. The talk will be informative, informal and fun, I hope! If anybody wants some high quality FITS data (up to 30 hours for one image) to practise processing, then I will make this available for free. How Do I Use My New Telescope? Bring your telescope along to a basic, practical session on how to set up, find a few objects in the winter sky and answer any questions you may have. Hot drinks will be available and we recommend warm, winter coats & hats for when observing from the field adjacent to our observatory. Try out some imaging using your mobile phone or ask about Astro-Photography using DSLR Cameras or even web-cams.